35 Trawlers and I can not find a list of names, am I looking in the wrong places. It was on March 6, 1915, on the same day as the fall of the Venizelos government in Athens, that Admiral Carden discovered his Achilles' heel. By tradition, British trawlers used for minesweepers were manned by civilian fishermen recruited in England's commercial ports. The Turkish guns couldn't reach the warships, but they were raking the trawlers, which backed away. 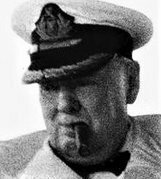 One trawler officer told Commodore Roger Keyes, Carden's chief of staff, that his men "recognize taking risks and don't mind getting blown up, but they hate the gunfire, and point out that they aren't supposed to sweep under fire, they didn't join for that." Keyes, the ablest officer in the operation, called for volunteer minesweepers from his Royal Navy tars. Meanwhile, he offered the fishermen bonuses. That night the trawlers tried again. The enemy surprised them with huge searchlights from Germany, uncrated that very afternoon. Blinded by their glare, the sweeper crews turned tail. Keyes pointed out that the enemy fire, though deafening, was wild. He persuaded them to try again the following night. Again they fled. As he wrote afterward: "I was furious and told the officers in charge that they had had their opportunity... It did not matter if we lost all seven sweepers, there were twenty-eight more, and the mines had got to be swept up. How could they talk of being stopped by heavy fire if they were not hit? The admiralty were prepared for losses, but we had chucked our hand in and started squealing before we had any." Any help with the names of Trawlers or crew would be appreciated. The converted civilian trawlers which attempted to contribute to the minesweeping effort in the Dardanelles were totally unsuited to the local conditions there. Specifically, the current flowing down the Straits ate into their [never great] forward speed leaving them to be, at best, very slow moving sitting ducks for the Turkish batteries. One trawler struck 84 times – how many times were the other trawlers struck? Thanks for that, Robinson was certainly a brave man. The quote from Keyes was taken from a paper written by Captain F M Pestorius USN(Retd) who credits (Manchester) It struck me as it is the sort of thing you would get from a Trawler Skipper. Very brave but not stupid!. I wonder were the original came from? HMS Amethyst took 6 Trawlers in to sweep and came out after 4 had been damaged by gunfire, dont know the date I will look at the killed and wounded to see if there is a mention af Trawler Names. In the action under discussion, only two ratings were killed in FENTONIAN. No other deaths are recorded in minesweepers. Hi, are the deaths in the dardenelle straits? what date did this happen? any wounded? only found one chap CPO Worrell? ask to many questions me! 29 Apr 1919 Gazette to the London Times gives a good account of the early naval campaign. Combined with the 16 August 1915 honours list, you have a lot of information. A lot of DSMs to trawler crews for services during the attack on minefields under fire. Unfortunately, minesweepers are only referred to by numbers, not by their names. If you do not have access to the Gazettes, let me know. Thanks never thought of that line. Have tried the Gazette but only seem to pull out DSO 1916 to HMT. I was able to find the information, searching for for AMETHYST. The trawler details are in the gazettes which also cover AMETHYST. My husbands Grandfather C.P.O.Edward Timothy Worrell was on a minesweeper called Fentonian.both he and a crewman were the only two crew members of that ship who were shot by enemy fire and died of their wounds the next day. He was 45 and served man and boy in the navy since 1885. he was 45 and in the reserves Edward Timothy Worrell left behind 3 small children under the age of 5 and a young wife.